I am excited to present a blog post from a REAL Women Facilitator and Soul Care Director, Ashley Gilbert. If you have ever tried to do something that seemed impossible, this blog post will inspire you. Experience it here and let us know what you think about it by leaving us a comment or emailing us at info@realwomenrock.org. To learn more about Ashley Gilbert and the work she does, visit her at Ground Zero or I Can Choose. 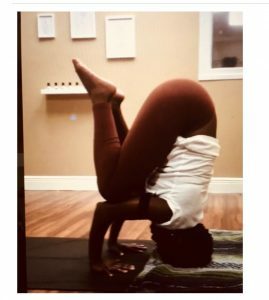 Last night in yoga class the challenge pose was a tripod headstand. I haven’t been able to do one of those since I was a kid! I have tried during class before and couldn’t even move into the pose. My limbs just wouldn’t allow me to. Well last night I DID IT! And held it for 1 whole minute! I am so proud of myself. Immediately, tears of joy streamed down my face. In that moment, I realized that somewhere along the journey I was growing, changing and getting stronger. I had made progress without even realizing. It wasn’t until I stepped out and tried something new, that I saw my growth!! I saw my potential to soar beyond my comfort zone. I am so empowered y’all!! The way I feel inside is indescribable. I know I can achieve anything that I am willing to work towards! Even when you can’t see it, continue the journey, keep doing the work. It may not come as soon as you want or packaged “perfectly,” but I know this for sure; in the end you will be stronger, wiser and healthier.